Technology has revolutionized many areas of modern life in recent times thanks to the incredible advances that have been made. It is clear how technology can help a business to improve its operation, but it can also be used by job seekers to improve their employability and find work opportunities. Finding work can be a huge challenge for many, but it can be made much easier when you know how to utilize technology to your advantage. Technology can improve employability regardless of your age, work experience and the industry in which you want to work. This makes it important for everyone looking for jobs to be aware of how it can help. First, technology can be used to make you much more visible to employers. Business owners will often look online when searching for suitable candidates which mean that this needs to be an area in which you can be found. This can be achieved by having your own professional website designed which acts as an online CV with your background, experience, skill set, work examples and references. You can then make this website more visible online through internet marketing practices like search engine optimization and pay per click advertising. In addition to this, you can also use social media to increase your web presence. Social media is an enormous platform to use so by setting up professional pages you can expand your network (more on this to come), advertise your services and communicate directly with potential employers. It used to be that if you wanted to develop your skill set and earn new qualifications you would have to physically attend a course. This is no longer the case as you can take all kinds of courses online to develop skills and bolster your resume. Arc Training is a good example of this as you can earn nationally recognized qualifications to help with career development and teach you important business skills that you need to go on and succeed. These courses can be taught both in the classroom and online with online training allowing you to do it in your own time and at your own pace. Additionally, the internet is a fantastic resource for learning with a lot of helpful information on how to develop important business skills, how to write a great resume, interview tips and other ways to get ahead and land your dream job. Perhaps the most impressive way how technology can help to improve employability is through creating learning experiences which can be used to develop skills in a safe environment. As an example, technologically advanced dolls that are similar to a human body can be used by trainee doctors to practice on with no risk. Another good example is augmented reality being used to mechanic apprentices to gain basic skills. Real life experience is often the best way to learn important skills, but there can be a great deal of risk that is attached to this which can be removed through technology. The rise in technology has also meant that people can now easily work from home in many different industries and stay connected to an office through video calls, emails, phone, instant chats etc. This can help to improve employability as it can allow people to work on a freelance basis which can make it easier find work than landing a full-time job. Additionally, this allows you the ability to work with businesses much further afield and even overseas which opens up your options drastically as you are not confined to businesses that you can commute to each day. The rise of technology and recent innovations has made it easier than ever for job seekers to find work. 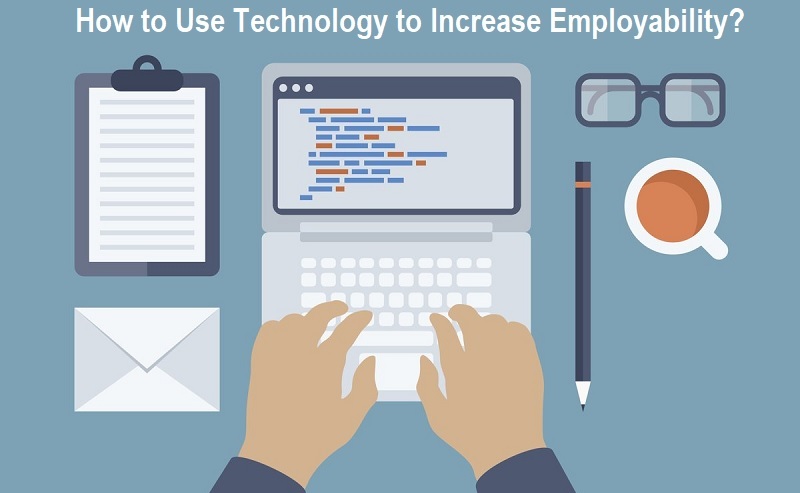 These are just a few ways that you can leverage technology to increase your employability and find work, but there are sure to be new methods that are developed over the coming years. It can still be highly competitive and you will need to develop important life skills to find work, but this can be made much easier through the use of new technology.